Paris Junior College offers many courses online. Students may take these courses by submitting work online while working through our online learning management system. Students will still be required to take some exams in a proctored environment, usually at one of the PJC testing sites in Paris, Greenville or Sulphur Springs. Online classes often fit into busy work schedules when traditional classes cannot, but students should keep in mind that some basic computer skills are needed for online work. Students should have these skills before enrolling in any Internet classes since the classes are designed to teach the course content, not computer skills. Students should be comfortable with the following items at a minimum. Students should have a computer and a reliable Internet connection capable of accessing video. Students should be able to send and receive e-mail with attachments. Students should be able to perform Internet searches and write with a word processing program. Students should have adequate typing skills and should be comfortable reading materials online. Students should have a computer manufactured within the last four years with audio capabilities and a word processing program, preferably Microsoft Word. Paris Junior College uses Blackboard for online courses. 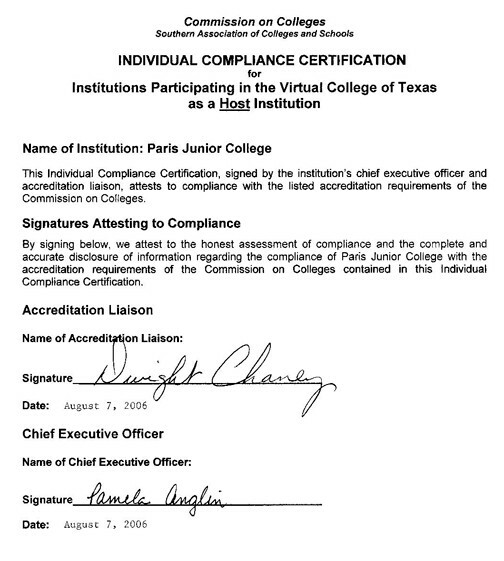 See our Virtual College of Texas Individual Compliance Certification.